Travel scholarship applications are released every summer and announced by early fall to support graduate students traveling to and participating in the annual conference. Attend the ASHE graduate student luncheon (if not scheduled to present at the same time) at the 2018 ASHE conference. 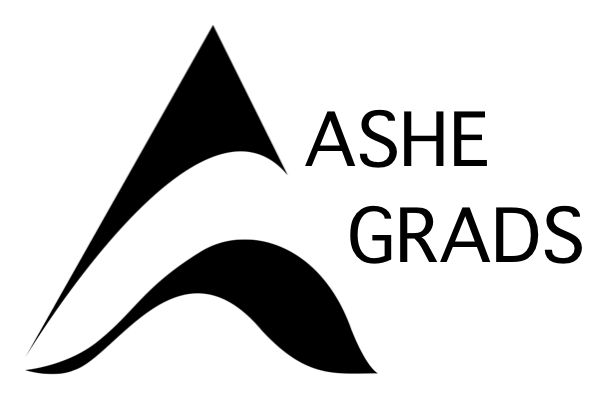 Write a blog entry for the ASHE Graduate Student Community on a topic of your own choosing, to be publicly available on the ASHE Grads website and social media accounts. Assist with the facilitation of at least one ASHE graduate student session at the 2017 conference (e.g. taking notes, distributing and collecting handouts and surveys, sharing information through social media, and answering questions). Attend a short meeting at the conference location with the ASHE graduate student representatives and other scholarship recipients. Provide a short biography to be placed on the ASHE graduate student website. Submit a thank you letter (within one month of the conclusion of the conference) to the ASHE Board, which may also be shared with donors to the scholarship fund. If called upon, assist with other ASHE graduate student initiatives during the academic year and help implement ideas for making ASHE more supportive of graduate students’ needs. Please note that while applicants are not required to be presenting at the conference in order to be eligible for the award, preference will be given to those presenting a research paper, poster, roundtable, or symposia at the conference. If you have any questions regarding the 2018 ASHE Graduate Student Travel Scholarship, please feel free to contact ASHE Graduate Student Representative Genia Bettencourt at gbettenc@umass.edu. To learn more about past awards applications, visit here. Click here to learn more our travel scholarship winners!